Join Rabbi Goldstein for discussion and reflection on a book that traces the rise of the white nationalist movement in the United States, providing disturbing but important information, as well as a hopeful glimpse at how change is still possible. There will be a few copies of the book available in the Shaare Emeth library. TUESDAY, JANUARY 22, 7 P.M. Discussion accompanied by coffees, teas, wine and dessert. MONDAY, JANUARY 28, 10:30 A.M. Discussion accompanied by coffees, teas, pastries and fruit. 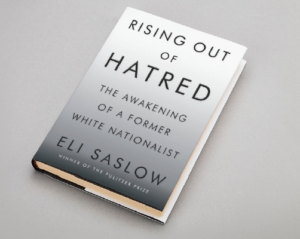 Rising Out of Hatred tells the story of how white-supremacist ideas migrated from the far-right fringe to the White House by tracing the incredible transformation of Derek Black, a young man who grew up in the epicenter of white nationalism. His father founded Stormfront, the largest racist community on the Internet. Derek eventually disavowed everything he was taught to believe at tremendous personal cost. Saslow asks what Derek’s story can tell us about America’s increasingly divided nature. This is a book to help us understand the American moment and to help us better understand one another.